This is the second of a four volume series presenting new Spanish works for solo guitar commissioned as part of the acclaimed guitarist, Adam Levin’s residency in Spain. Amongst a wealth of exciting new names there are also some established composers such as Balada, whose imaginative re-invention of Granados’s Danzas españolas opens the recording, García Abril and Casablancas, already made familiar through an extensive catalogue of recordings on Naxos. Volume 1 [Naxos 8.573024] was hailed by Scene Magazine as “one of the essential collections of solo instrumental performance released in the past 50 years”. The guitarist Adam Levin has performed extensively throughout the United States, Europe, and South America. Levin has received numerous top prizes, including the Fulbright Scholarship, the Programme for Cultural Cooperation Fellowship from Spainʼs Cultural Ministry, and the Kate Neal Kinley Memorial Fellowship to research and perform contemporary Spanish guitar repertoire in Madrid. While studying in Spain, Levin commissioned thirty solo guitar works from four generations of contemporary Spanish composers, which resulted in a contract for a four-volume encyclopedic series for Naxos, 21st Century Spanish Guitar. 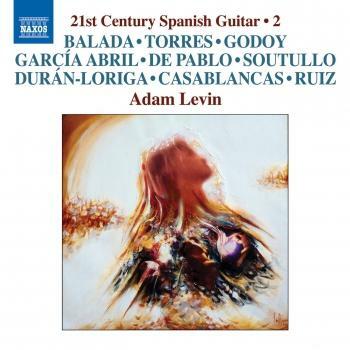 Levin has released five critically-acclaimed albums, including In the Beginning (2009); Duo Sonidos (2010); Music From Out of Time (2010); Fuego de la Luna (2011), and 21st Century Spanish Guitar, Vol 1 (2013), which was selected as a “Recording of the Year” by MusicWeb International. Levin is a graduate of Northwestern University and New England Conservatory. His esteemed teachers included Eliot Fisk, Oscar Ghiglia, Gabriel Estarellas, and Anne Waller. Adam Levin is a DʼAddario Artist.